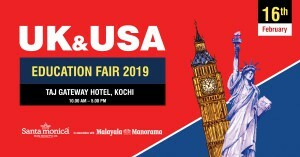 The Santa Monica Overseas Education Expo 2018 , South India’s biggest convergence of 50+ world class universities/ institutions from 10 + countries, including Canada, New Zealand, Australia, UK, , Ireland ,Sweden, Germany, Switzerland , Singapore …will be held at three prominent Kerala cities, Trivandrum at Hotel Taj Vivanta on 27th September , Kochi, Hotel Taj Gateway on 29th September and Calicut Hotel paramount Tower on 2nd October respectively. The expo, organized by Santa monica Study Abroad, one of south India’s most reputed overseas education consultants, in association with Malayala Manorama would offer excellent opportunity to students who have completed their 12th grade, those undergoing Bachelors degree or looking for diploma or Masters Programs in varied fields ranging from Engineering/IT, Business Management, MBBS, Nursing/Healthcare, Hospitality, Tourism and more to gain authentic information directly from official representatives on various programs and admission criteria and further discuss their profile and choose an institution and program that best meets their needs. The overseas Education Expo over the years has become South India’s largest study abroad Expo, much awaited by students and parent community of Kerala to make an informed choice in selecting world class institutions to study abroad, which is evident from phenomenal footfall it generates edition after year. Exhaustive seminar sessions by experts on topics ranging from job-centric programs, Education loans, scholarships/internships stay back, work rights spouse accompaniment rights visa, PR options, Part-time/ full-time jobs coupled with personalized education counseling, spot offers based on eligibility, assistance for hassle free education loans, application fee waivers free IELTS, PTE training for students registered with Santa Monica makes it a must visit for seeking best of world class education avenues abroad all under one roof . HOW TO DRAW MAXIMUM BENEFIT FROM THE EXPO? Visit the dedicated expo website www.overseaseducationexpo.com, using the student registration link, you will be attended to on priority basis, and would be appropriately guided through accurate career counseling, course options based on the registration info you have submitted. This entry was posted in overseas education expo, Overseas Education Expo 2018 on September 15, 2018 by Rejith Mohan. Since time immemorial USA is considered as the most sought-after destination for higher education. The wide range of scholarship options with a high standard of education is a pivotal reason, behind the success of US to stay in the front row despite the high competition from all around the world. Availability of specializations’ concerning anything under the sky is another peculiarity of US. Their extensive array of courses in the field of bio-science, engineering, business, mathematics, law etc. is a great example for this. The most distinctive factor that differentiates the US from other countries is, students, do not have to engage in mundane part-time jobs rather they could do quality jobs like graduate assistance-ship, teaching assistants, campus tech support etc. while they study. The Universitas 21 has continuously ranked US in the first position for the past few years. This shows the uncompromising effort made by the universities as well as the government in minute details pertaining to maintaining the highest quality parameters. 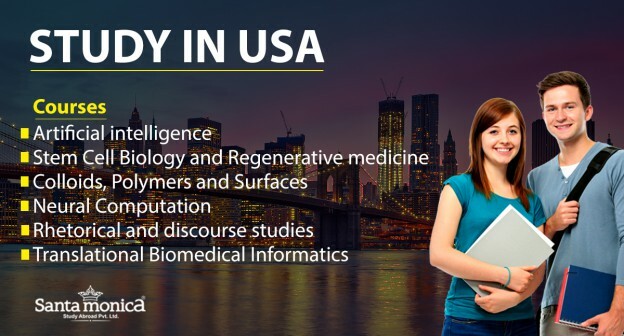 The US is the home for most prestigious universities like Harvard, Yale, Stanford etc. Every university has representations of students from all parts of the world. This diversity in the culture equips the students to endure on a global platform which is very much essential in this era of globalization. 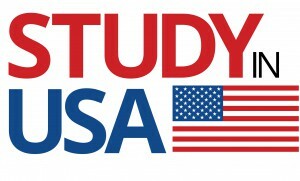 The USA is the only country offering the students the complete liberty to customize the subjects’ according to their field of interest and also to combine two or more diverse field of studies by taking double majors. This could diversify the academia of prospective students. The OPT and CPT provisions offered by the universities, facilitate the students to get a hands-on industrial experience, which would catalyst the chance of employment. A higher degree from any US university would potentially distinguish a student from his fellow competitors in every aspect of life. 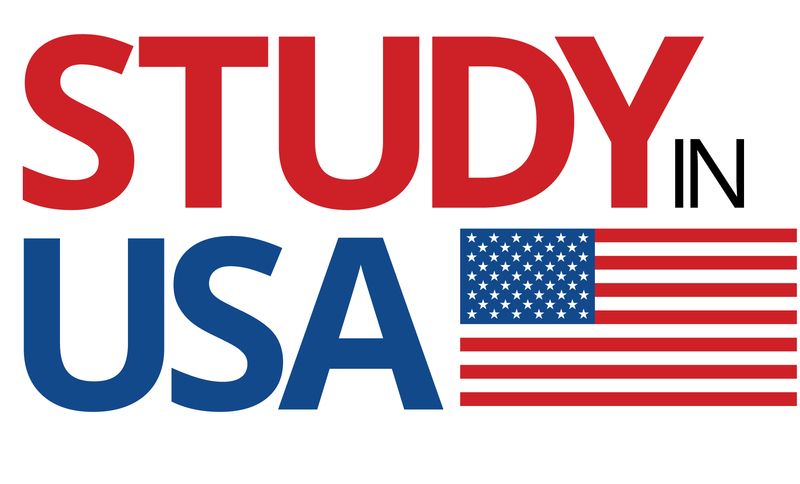 This entry was posted in Study in USA and tagged Study Abroad, Study in USA on February 28, 2018 by Rejith Mohan. Europe has long been known for their high academic standards, cutting-edge research and their value for money. With more and more of these institutions introducing English as the language of instruction Europe is now better placed to deliver course of study that meets one’s career needs in today’s global market. There are endless choices from highly ranked research universities to smaller, specialized European colleges that give you an education that employers around the world will really value and respect. Diverse range of higher education study programmes are on offer across Europe – Most higher education study programmes have a ‘modular’ structure. This means that you can build a personalised programme by choosing several different modules or units of study each year from a wide selection. From Business and Economics to Engineering, Life Sciences (including medicine), Social Sciences and Humanities subjects, the popular tag of Europe as a most desired study desination is here to stay. 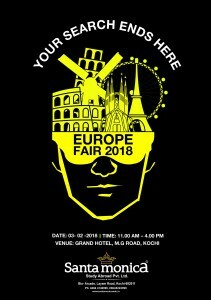 To know more about life changing job oriented oriented study programs across Europe, visit the study in Europe fair on 3rd February 2018 from 11 Am – 4pm at Grand Hotel , MG Road, Kochi, organized by Santa monica study Abroad Pvt. Ltd. , your most trusted overseas education consultant of India . The fair would see exhibitors from 20 + countries of Europe including Russia, Germany, Sweden, Finland, Latvia, Poland, France, Switzerland, Lithuania, France, Latvia, Malta, India ,Netherlands , Spain etc. For more information and registration call 0484-4140999. This entry was posted in Europe Education fair 2018 on January 8, 2018 by Ronnie Fredrick Thimothy. 3. The Swedish market is considered to be so trendy that it is often used by International companies to test new products. Research and development, information technology and bio-medicine are some of the most heavily-funded Sweden’s business sector, putting them in the top percentile of countries in the world for published research and inventions. 4. Inventors, scientists, computer programmers, and anyone interested in cutting edge technology will find this small country a world of inspiration. 5. Sweden, has always taken academia seriously. Standards of achievements remain high. Universities work closely with industries to give students practical experience and the independence they need to be competitive. This gives you distinct advantages over your peers when entering the job market. 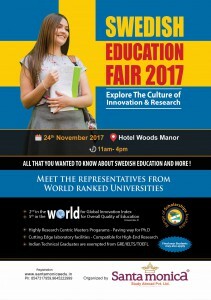 With the Sweden education fair happening on the 24th of November 2017 from 11 am -4 pm at Hotel woods manor, at the heart of the Kochi city, there cannot be a better opportunity to explore diverse job- centric programs offered by top rated institutions from Sweden. Organized by your trusted overseas education consultant Santa Monica study abroad Pvt. Ltd. For registration and more details kindly contact -0484-4140999. This entry was posted in Study in Sweden on November 21, 2017 by Ronnie Fredrick Thimothy. Thousands of students apply to foreign universities each year to pursue their career abroad. They seek exposure and quality educations that help them enhance their capabilities. Scholarships have always helped students support their finance for courses falling outside their budget. SCHOLARSHIPS – GENERAL NATURE – British Council IELTS Scholarship Award– Funded by the British Council ,open to all Indian students, of all levels studying outside India, who have recently taken IELTS with British Council. Inlaks Shivdasani Foundation Scholarships– For Indian students interested in studying in North America or Europe both for graduate and post graduate programs. Charles Wallace India Trust Scholarships –Offered to Indian students looking to pursue Doctoral degrees or research in UK. British Council GREAT scholarships for Indian students– Offered to Indian students who wish to pursue higher studies in UK. Fulbright-Nehru Research Fellowships – For outstanding Indian students looking to pursue studies at any level in any accredited US institution. Margaret McNamara Memorial Fund Scholarships. 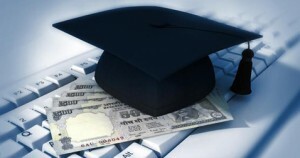 Global Leaders Scholarships for Indian Students – 10 scholarships offered to Indian students to study an applicable business-related postgraduate course. Swedish Institute Study Scholarships (Sweden) For highly-qualified international students from developing countries for master’s level and covers tuition fee, living expenses, some travel grant, and insurance. Eiffel Excellence Scholarship Programme (France) Eiffel scholarship-holders receive a monthly allowance and other expenses such as return trip, health insurance and cultural activities. It does not cover tuition fees. Swiss Government Excellence Scholarships for Foreign Students (Switzerland) opportunity to pursue doctoral or postdoctoral research in any academic field at one of the public funded university or recognized institution in Switzerland and covers a monthly allowance, tuition fees, health insurance, lodging allowance, etc. Danish Government Scholarships for Non-EU/EEA Students Danish Ministry of Education fund highly qualified and motivated international students from outside the EU/EEA for full degree higher education programme Includes partial tuition fee waivers and/or grants towards covering your living costs. Santa monica study abroad your trusted study abroad consultant’s understand how much a scholarship would ease your financial strain while pursuing a course abroad Our comprehensive scholarship assistance include appraising eligibility criteria to guiding applicants in the right manner and help them avail scholarships offered by colleges, universities and government bodies from time to time. For more info call us on 0484-4140999 or visit our nearest office. This entry was posted in Scholarship for studies abroad on October 19, 2017 by Ronnie Fredrick Thimothy. 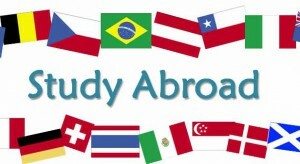 Q Which are the popular countries for pursuing higher studies abroad? Canada, Australia and New Zealand are most preferred for higher studies in IT, Engineering, Accounting, Business, Hospitality, Nursing, etc. While USA tops for IT studies, engineering qualifications earned from Germany, Sweden and Norway are gaining global attention. Singapore is increasingly becoming popular for cost-effective western university qualifications. Countries like Russia, Ukraine, Bulgaria, Latvia, and Lithuania, Azerbaijan, Hungary, Romania, Serbia, Malaysia, Philippines, China offer quality and cost effective courses in medicine studies. Q What are the different ways of financial support for my studies abroad? The different methods to support your studies abroad are: Education loans, Sponsorship by individuals / organization; Scholarships by Indian/foreign governments, private trusts and also individual universities. Q What are the post study job prospects available abroad? Most countries offer stay-back options for students to explore job opportunities on successful completion of their studies. The Co-ops and internships during the study help the students to network and search for employment opportunities after the completion of the course. Countries such as Canada, Sweden, Germany, New Zealand, Australia, etc, encourage students to stay back and explore job and PR opportunities after their successful study and few years of work/stay in the country, subject to certain conditions. Your family can accompany you for your studies; however, the work rights for your dependents are subject to the laws of that country which may change from time to time. Q What services can I expect from a study abroad consultant? Experienced and trusted consultants like Santa Monica provide candid counseling in choosing the right study options as well as assist you in applying to the institutions of your choice, getting offers, availing bank loans and scholarships, payment of tuition fees, visa documentation, pre-departure guidance and domestic (Global SIM card , air tickets, money exchange) and post landing assistance including (airport pick up, temporary accommodation, job search, community connections, legal issue helps, etc) to help ensure you have a smooth transition. Q What are the entrance tests/proficiency tests/ important requirements to study/ migrate abroad? All the western countries insist that the students belonging to non-English speaking countries should be able to handle the English language fluently while studying in their country for English taught program. English language proficiency is therefore an important requirement to assess your visa application and hence we would recommend having English language proficiency scores. English Language Tests: Pearson’s PTE Academic (PT)/IELTS/TOEFL are the most common English language proficiency tests accepted by the institutions and immigration authorities across the world. Please check individual institution/official immigration department website for their requirements. For MBA/Engineering studies in many countries Graduate Record Examinations (GRE) standardized test used to get admissions in various graduate schools or business graduate schools in various English speaking countries, especially the United States. Graduate Management admission Tests (GMAT) scores are used by graduate business schools to make admission decisions. Still have more questions kindly visit your nearest Santa Monica branch or mail us at nfo@santamonicaedu.in. You may also call us at 0484- 4140999/+919645222999 or visit www.santamonicaedu.in for more details. This entry was posted in Study Abroad on September 30, 2017 by Ronnie Fredrick Thimothy. At a time when employers around the world are seeking individuals with international education and exposure to be part of their futuristic enterprises, informed parents and students have risen up to the fact that studying abroad is their best bet in ensuring a rewarding career at a global stage. This is evident from the ever-increasing trend of students embarking to foreign institutions. As per latest industry estimates, over 4 Lakh students opt to enroll for various programs ranging from certificates to Diploma’s to graduate, Postgraduate and Doctoral studies in international universities/institutions every year. However, with a gamut of universities and institutions across the globe, offering a myriad of study programs across streams, it is quite normal to get confused as to which one to choose that would be best in one’s interest. The Overseas Education Expo September 2017 organized by Santa Monica study Abroad Pvt. 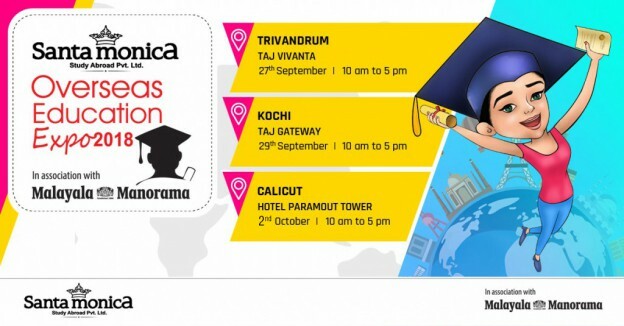 Ltd in association with Malayala Manorama co. Ltd. on 23 rd and 24th September 2017 at Taj Gateway, Kochi, intends to demystify overseas education and would serve as the ideal platform for students and parents to explore various study options abroad, offered by 100 + top class universities/ institutions from 25+ countries in varied fields ranging from Engineering/IT, Business and Management, Medicine, Nursing/Healthcare, Hospitality, Tourism and more. Visitors will have the opportunity to have a one on one session with university/ institutional representatives and clear queries regarding courses offered the admissions process, entry requirements etc. Exhaustive seminar sessions by experts on topics ranging from job centric programs, Education loans, scholarships/internships, stay back and work rights visa, PR options, Part time/ full time jobs will be held as part of the Overseas Education Expo September 2017 . It doesn’t matter even if one hasn’t decided on which program or university to choose, which, one certainly will, after visiting the expo. Student’s can use the dedicated expo website www.overseaseducation expo.com and view full list of exhibitors, which would give them a fair idea about the participating universities/institutions. For more information on the Santa Monica Overseas Education Expo September 2017 and registration log on to the dedicated education expo website www.overseaseducationexpo.com at the earliest or call 0484-4140999. This entry was posted in Overseas Education Expo Sep 2017 on September 8, 2017 by Ronnie Fredrick Thimothy. 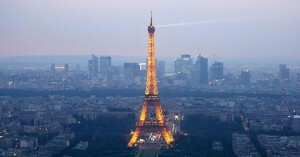 What makes Europe an Irresistible Study Abroad Destination? Europe has long been known for their high academic standards, cutting-edge research and their value for money. With more and more of these institutions introducing English as the language of instruction Europe is now better placed to deliver course of study that meets one’s career needs in today’s global market. There are endless choices from highly ranked research universities to smaller, specialized European colleges that give you an education that employers around the world will really value and respect. Diverse range of higher education study programmes are on offer across Europe – Most higher education study programmes have a ‘modular’ structure. This means that you can build a personalized programme by choosing several different modules or units of study each year from a wide selection. From Business and Economics to Engineering, Life Sciences (including medicine), Social Sciences and Humanities subjects, the popular tag of Europe as a most desired study destination is here to stay. To gain more insight, exhaustive information on job oriented study programs across Europe , most suitable for you, visit Santa Monica study abroad Pvt. Ltd., your most trusted study abroad consultant based in Kochi with 15+ years of experience and professional expertise facilitation overseas admissions to over 300 universities/ institutions across 30 countries or call at 0484-4140999. This entry was posted in study Europe on July 27, 2017 by Ronnie Fredrick Thimothy.